This is untrue. No one who studies rightwing violence things that Trump’s words are irrelevant. No one. Trump has made life scarier for Jews, Muslims, and people of color. We have 1000 investigations of domestic extremism open, nearly concerning rightwing threats, they’re still not able to identify all the risks. This isn’t new. It’s just the fruit of what some of us have been saying for a long time. None of this is a surprise. This week was hard, with bombs sent to Trump’s political opponents, an attempted mass attack on a black church followed by the killing of black Kroger shoppers when the gunman couldn’t access the church, followed by a mass shooting of Jewish elders in Mr. Roger’s old neighborhood in Pittsburgh. 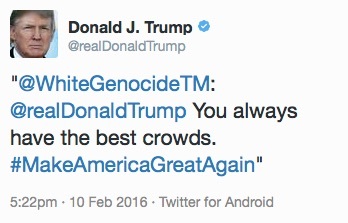 Above, in a deleted tweet, Donald Trump accepts the praise and re-tweets a neo-Nazi. “White genocide” refers to the idea that non-whites are victimizing whites to the point of extinction; it justifies everything from immigration policies that exclude non-whites from entering the nation to violent attacks on people of color to segregation. The owner of the account used a profile of the founder of the American Nazi party as his profile picture. Trump’s winks at white supremacy–calling himself a proud “nationalist,” for example, while knowing that his followers will fill in the word “white”–cost 11 elders, including a Holocaust survivor, their lives yesterday. If we don’t have another hate-based, Trump-inspired violent act today, we have to consider ourselves lucky. But this is how it’s going to be from here on out: a week with “just” three acts of violence will feel like a good one unless Trump is silenced. The best way to do that would be for Congressional Republicans or cabinet members to act. Maybe Republican Senator Pat Toomey from Pennsylvania might care to speak up. I would like to at least see Mitch McConnell and Rand Paul face questions about the racist murders of Kentuckians Maurice Stallard and Vickie Lee Jones. And Marco Rubio should have to explain how, exactly, a man whose van (also his home) was covered in vitriolic pro-Trump bumper stickers, just happened to choose Trump’s biggest critics to send bombs to. We need Republicans to act, first, because they the ones who can make this happen and, second, because if Democrats are the ones forced to do it (either in the midterm election, please God, or 2020), the nutjob elements of the Republican party will not accept their decision to impeach or their presidential election votes as legitimate. We need Republicans to act because, by forcing Democrats to do the job of saving the nation from rising radicalism, they make that mission much harder. But I see why they don’t want to rebuke the President, even though, if Trump didn’t re-tweet Nazis or repeat anti-Semitic tropes that Jews are weak and won’t defend themselves from attack, the 11 people killed yesterday at Tree of Life Synagogue would be alive. (Absolutely. I absolutely believe that these people are dead because Trump is president, and I believe that they would be alive if he were not.) The GOP’s base includes too many deplorable people. I don’t mean those who would actually pick up a gun and kill an elderly person while they worship but those who will say that it’s a false flag operation or blame the victims by saying that they should have been armed–like the 3 police officers, I guess, who were also shot by the killer. These are people who say that dead kindergartners are the price we pay for the freedom to own high-capacity guns. into the mainstream. The Trump campaign was accompanied by the massive infusion of fringe motifs including the denigration of ethnic and religious groups; the support of political extremists; and the acceptance of conspiracy theories. As the fringe becomes legitimated by this mainstreaming, the possibilities for violence increase. That’s the abstract of “President Trump and the ‘Fringe,'” which was published in April 2017. (It’s fully online for free; please read it!). Conservative Christians have been trying to argue that Trump is the fulfillment of Biblical prophecy. In this, they show how they misunderstand prophecy: it was never about the far-off future. Biblical prophecy is about reading the moment and seeing how it could lead to a particular future. The real Trump prophecy isn’t that the Bible predicted him; it’s that his words will kill people. We knew this would happen. We chose it anyway.